George R.R. Martin revealed to fans today that a new volume about Westeros will be hitting the shelves this November. 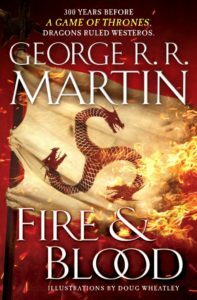 Sadly, it won’t be The Winds of Winter, the long-awaited sixth book in the A Song of Ice and Fire series, but Fire and Blood, a daunting history of House Targaryen. “No, winter is not coming … not in 2018, at least. You’re going to have to keep waiting for The Winds of Winter. You will, however, be able to return to Westeros this year,” Martin said. In news that surprised no one in the ASOIAF fandom, GRRM has not yet completed The Winds of Winter but he has managed to put together a nearly thousand-page book about the backstory of the Targaryens. The last book published in the ASOIAF series was A Dance with Dragons, way back in 2011 when Game of Thrones premiered. We’re now approaching the eighth and final season of the television adaptation in 2019 and the sixth book is nowhere to be seen. GRMM talked more about the book on his blog, calling it “the GRRMarillion (or the first half of it, at least); that is to say, my version of Tolkien’s mammoth history of Middle Earth.” This will be the first of two histories of Westeros. So, if you’re up for burying yourself deep in Targaryen timelines and Westerosi lore, don’t miss the release of Fire and Blood on November 20. Meanwhile, GRRM did confirm that he will get back to working on The Winds of Winter.